From 2009-2012, we were funded by the NSF to study the importance of iron (Fe(III)) reduction as a dominant anaerobic process in soils of the Arctic Coastal Plain, near Barrow, Alaska. Fe(III) can serve as an alternative electron acceptor for anaerobic respiration when oxygen is depleted. What is special about Fe(III) is that it generally occurs as large, insoluble oxides and can’t easily be transported into the cell the way oxygen, nitrate, sulfate or other terminal electron acceptors can. So Fe(III)-reducers often have to rely on extracellular electron transport proteins in their cell membranes. I think of it as little ray guns that can shoot out waste electrons into the environment at either Fe oxides or humic substances (large organic molecules that can also be used by these microbes for respiration). 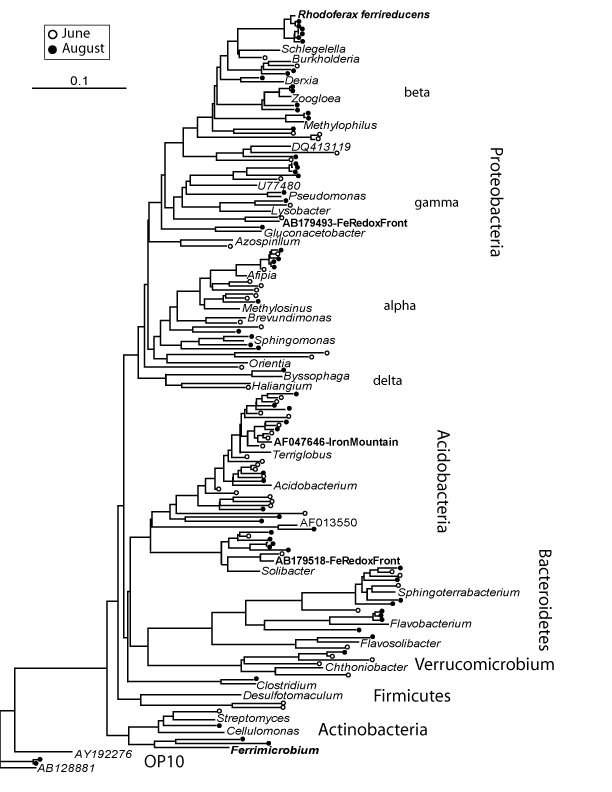 Our first clue that this anaerobic pathway was important in the Arctic was the abundance of sequences closely related to Rhodoferax ferrireducens (now called Albidiferax), a famous Fe-reducer, as its name suggests. 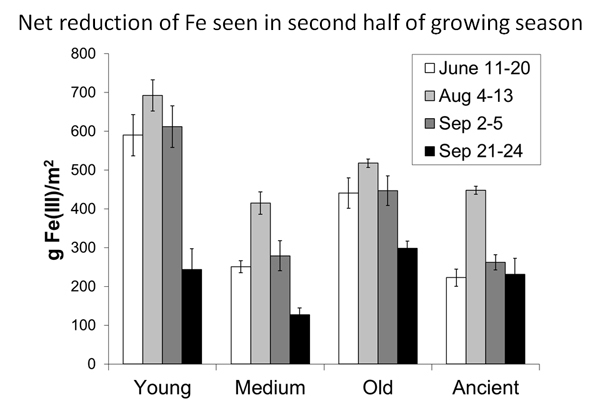 So we looked for other evidence of Fe-reduction. There were reducing, low oxygen conditions across most of the landscape, very low concentrations of other alternative electron acceptors (like nitrate, sulfate or manganese) and very high concentrations of Fe, both in soluble and solid form. 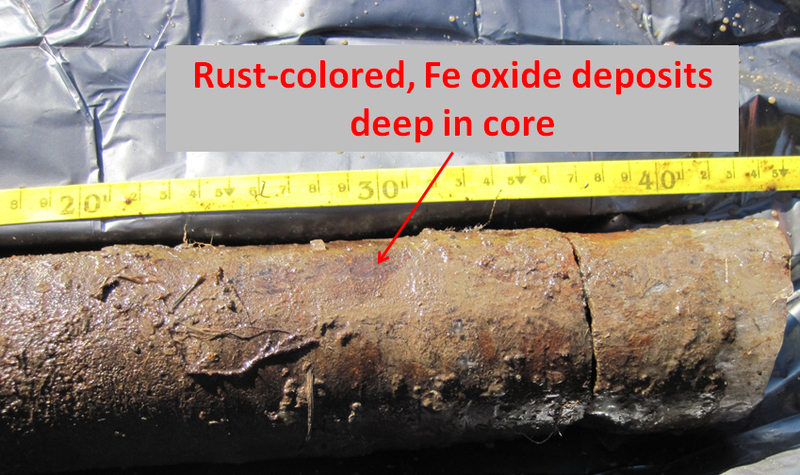 If you look close, you can see a rusty patch down in the depths of this core. The silty mineral layers below the organic horizon supply large amounts of Fe in these soils. 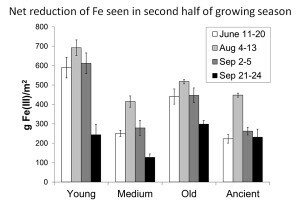 The Fe in the soil cycles between its oxidized and reduced form. We saw net Fe reduction in the second half of the summer in four different study areas. Based on these data and measurements of respiration, we calculate that Fe reduction could account for about 43-63% of ecosystem respiration. Since Fe-reducing microbes generally have the ability for extracellular electron transport, they can also donate electrons to electrodes, generating a small current. Our collaborators, Cornell environmental engineer, Lars Angenent and his student, Elliot Friedman, designed sensors that could measure this process in the rugged Arctic environment. We sequenced soil metagenomes to get a better idea of how this community was able to reduce Fe so effectively. We found many known Fe-reducing species, and also a large number of DNA sequences for multi-heme cytochrome genes. These are proteins that bind heme groups, like the hemoglobin in our blood, but these bind many heme units per individual protein. Basically all these heme groups give cells the ability for long-distance electron transport. 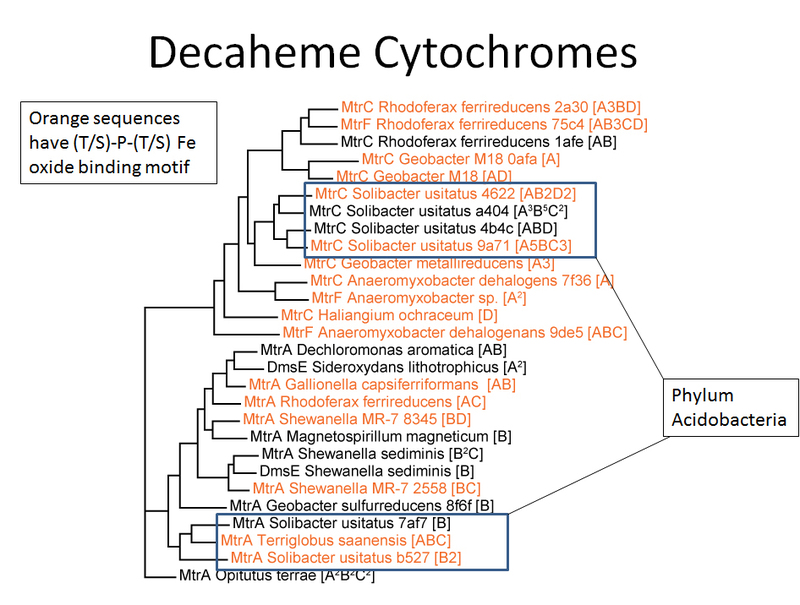 In particular we found many decaheme cytochromes (10 hemes/protein), some belonging to well-studied Fe reducers, but others belonging to Acidobacteria. This phylum is a little mysterious due to the low number of isolates that have been cultured, but one (Geothrix) is a known Fe-reducer. It looks like Acidobacteria, which are very abundant in these soils, play a major role in Fe reduction. To read about our experiences of Arctic research, check out the Bog Blog. Lipson D.A., T. K. Raab, M. Parker, S. T. Kelley, C. J. Brislawn, J. Jansson (2015) Changes in microbial communities along redox gradients in polygonized Arctic wet tundra soils. Environmental Microbiology Reports 7(4), 649-657. Lipson D.A., Zona D., Raab T.K., Bozzolo F., Mauritz M., Oechel W.C. (2012) Water-table height and microtopography control biogeochemical cycling in an Arctic coastal tundra ecosystem. Biogeosciences 9:1-15.